Our headliner this month is a debut novelist. Beth Underdown used to work at Phaidon Press before joining the University of Manchester’s Centre for New Writing as lecturer. Her first book The Witchfinder’s Sister centres around Alice Hopkins, brother of Matthew Hopkins, the Witchfinder General who hunted down over a hundred so-called witches in the seventeenth century Essex. 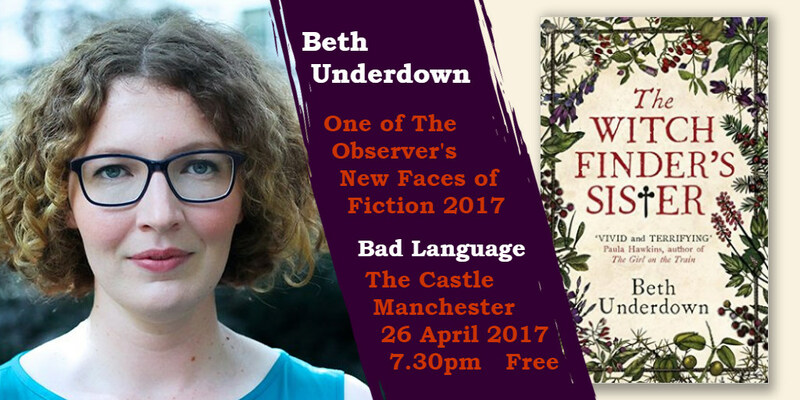 Beth Underdown is no stranger to Bad Language, and we’re delighted to welcome her to our stage. Our open mic this month is: Essjay, Zena Barie, Francis Wyne, Mark Rawlins, Cameryn Moore, Jo Howard, David Judge, Kofi Gyamfi, Rosie Fleeshman, Katie Cleaver. Wednesday 26 April 2017, 7.30pm at The Castle pub, Oldham Street, Manchester. Free admission. Join the Facebook event here.